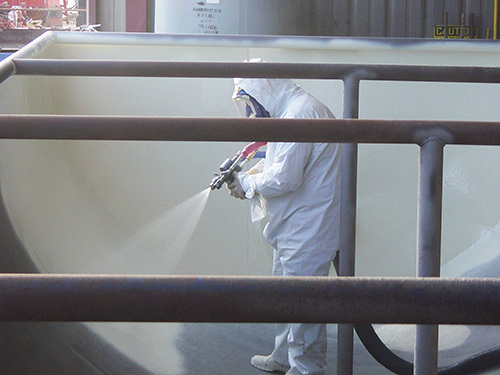 Spray-on protective coatings manufacturer Rhino Linings Corporation (San Diego, CA) has announced a new addition to its growing line of industrial-grade protective linings. Said to be its most chemical resistant product to date, HiChem 11-70 is a two-component, 100 percent solids, zero-VOC polyurethane lining, which the company says is ideal for corrosive material containment. These characteristics also meet the growing demand for eco-friendly coatings and linings, it adds. According to Rhino Linings, its new two-component, 1:1 mix ratio polyurethane lining exhibits high levels of chemical and corrosion resistance, ideal for corrosive material containment. The elastomeric protective lining provides excellent stability for immersion applications and where high levels of chemical resistance are required to deliver superior corrosion protection, the manufacturer notes. According to the company, HiChem meets NSF Standard 61 requirements for use in potable water storage tanks at sizes of 5 gallons and larger, or pipelines with a diameter of 0.75 inches or greater. “Our new industrial-grade chemical-resistant coating is ideal for businesses looking to extend the life of company equipment and facilities while meeting stringent federal containment regulations concerning waste management and safety storage of hazardous materials,” says Rhino President and CEO Pierre Gagnon. The polyurethane lining may be applied using plural component spray equipment to concrete, fiberglass, plastic, metal and wood, including steel tanks, pipelines concrete basins, reservoirs, aerators and digesters, the company explains. The protective coating creates monolithic, seamless protection that conforms to any shape and size, it adds.